This couple contacted us about being their photographers for their wedding in Logan, Utah a few months before their wedding. We were so glad they did because they are such a fun and genuine couple. The bride works as a tatoo artist. Seriously, this girl is amazing at what she does. The art she creates is phenominal. The groom manages a Hot Topic. He's pretty amazing at what he does too. He knows how to keep the workers happy and minimize the drama between coworkers. That's a pretty amazing feat! 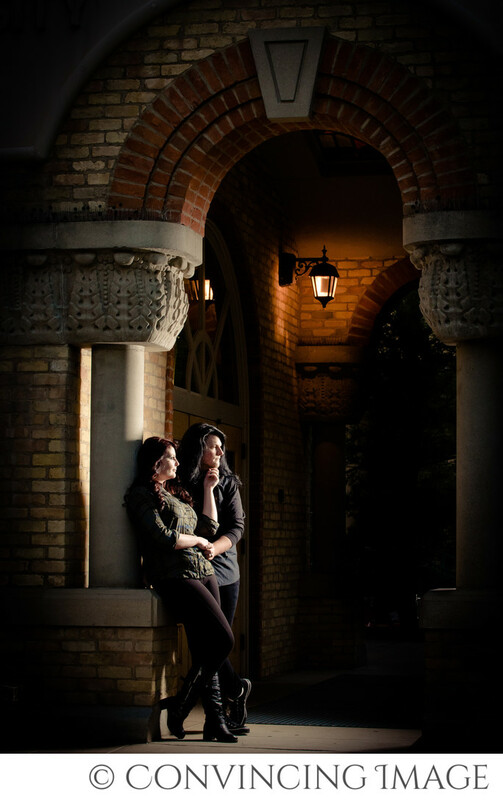 When we started styling their session, they told us that they loved gothic architecture. But guess what? Logan, Utah has very little creative architecture. Fortunately, they also like mountainy looks. We have those in abundance. But without going to Europe for their engagement session (which we would totally do for the right price! ), we were limited to Logan's basic buildings. After spending some time in the mountains, we decided that Utah State University would be the place to go to create a look that fit in that realm. Old Main has the archway and a bit of old charm. No gargoyles, the still cool enough. To give a somewhat simple building a more gothic look, we make the lighting dramatic by using an off camera flash to create a rim light on the couple. We kept the ambient light at bay by using a smaller aperture. The couple loved it! That's the important point. Your photographer should work with you to create some shots that fit your style, even if the ideal location isn't within reach. This couple loved the results of our efforts. Location: Old Main, Logan, Utah.